The Triathlon Swap is a great way to purchase or sell gently used triathlon and general cycling gear and clothing. Retired cyclist and triathletes ready to unload old equipment, gear hogs looking to clear up space in their garage, and new athletes looking to ease the cost of getting started in the sport will not want to miss this event! The Tri Swap is also our annual store sale, so almost everything in the store is on sale. Sale Date: Saturday, September 1 (10am-4pm) AND Sunday, September 2 (10am-4pm). 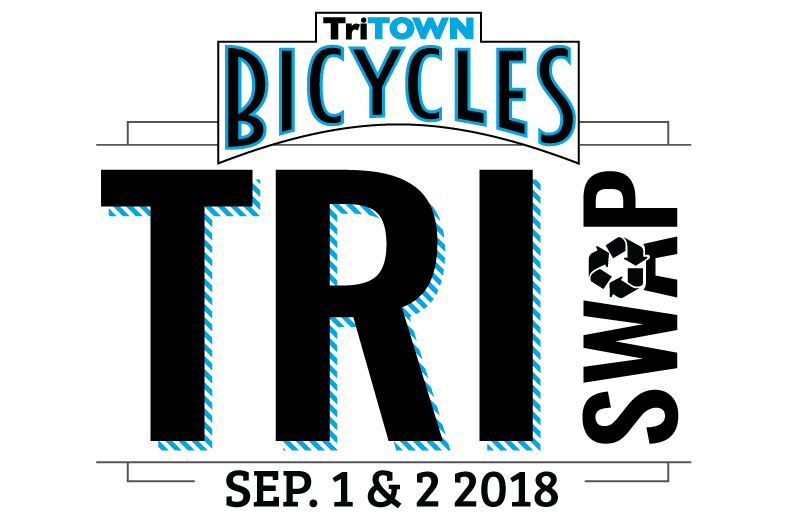 Gear Drop Off: The 5 days before sale (Mon-Fri), 10-7pm at Tri Town Pickup: Any unsold gear must be picked up by the Tuesday & Wednesday after the Swap during normal business hours (10-6pm). Where: The Swap takes place in our rear parking lot. You can enter the swap through the normal entrance to the store and simply walk through the store to the back parking lot. Payment methods: Visa, Mastercard, AmEx, and cash are the only methods of payment accepted. Sorry, no checks. WHY WOULD I WANT TO SELL STUFF AT THE TRI SWAP? Great question! The Tri Swap is conveniently timed near the end of the triathlon season, making it a great time to unload some of the gear you no longer need, and invest that money into some new gear that you really want. This year we moved the swap up 1 month from prior years, so if you are looking to purchase gear there are still plenty of races later in the season to put your new equipment to good use at. We take care of all the marketing, staffing, merchandising, and payment handling. Additionally, we take almost all forms of payment, so potential buyers can use their credit cards which increases the likelihood that your high-end race wheels or triathlon bicycle will sell. Essentially, we make it really easy on you! All you have to do is drop your gear off at TriTown, tell us how much you want to sell it for, and we take care of the rest. I WANT TO SELL STUFF AT THE SWAP! Gear drop off: All you have to do is drop off your gear at TriTown sometime the week of the event. We'll take your name and all contact information, then tag, store, and merchandise your items for you. If you have a lot of stuff we recommend bringing it earlier in the week before things get a bit crazy the closer we get to Friday. Gear pick up: If your equipment does not sell, we ask that you pick it up the Tuesday or Wednesday following the Swap between our normal business hours of 10-6pm. If you do not pick up your equipment by closing time Wednesday Your gear will become property of Tri Town unless prior arrangements are made with Tri Town staff. Pricing Equipment: You have the option to let any of your items drop in price 20% if it does not sell the first day of the event. Items that drop in price Sunday will be specially marked with a highlighter and visible to all potential buyers. This is a great way to make sure your items sell. Option 1: TriTown takes a 17.5% commission on all gear sold. This is taken off the final selling price, not including sales tax. This commission covers all handling of your gear, storing, merchandising, selling, and credit card processing fees. Option 2: 100% In-Store Credit. Take the entire sale price of your items as In-Store Credit to use for TriTown store purchases. This is a great option if you were planning on buying a new bike, wetsuit or any gear in the near future. You can even use your store credit for bike repair or coaching services. Payment: If you take the standard commission option, you will receive a check for your sold gear no later than 2 weeks after the Tri Swap. Historically, sellers have received their check within 7 business days. One check will be written for all of your items sold at the swap, and you will receive receipts for all sold items. If you choose the in-store credit option your credit will be available to you by Wednesday after the swap. I WANT TO BUY STUFF AT THE SWAP! Great, you'll find a lot of great things to kickstart your next triathlon training and racing season! In addition to all the great items at the swap, Tri Town will be hosting a store wide sale on most in-stock items. After you've browsed the items on the lot, be sure to check out what is available in the store. Sunday Discount: Some items will be marked down 20% on Sunday, these items will be marked with a highlighter on their price tag. It is up to the seller to determine if they want their item to drop in price on Sunday. All items will be sold at 100% of asking price on Saturday. Payment: Cash, Visa, Mastercard, AmEX, and yes you can use Tri Town Gift Cards. Normal 6% Idaho sales tax applies for all purchases. Returns: ALL SALES ARE FINAL. We try to inspect all equipment integrity before allowing it to be sold at the swap, but we are not responsible for any items that do not work as intended or fail due to manufacturing problems. We cannot check to see if a power meter is measuring accurately, or if a GPS device downloads data... you get the idea. Please inspect all your items thoroughly and make sure it is perfect for you before purchasing.